One product that I was given the chance to review this holiday season has been a hit with everyone who has seen it. Which item is that? The Butter Bell. This handy addition to the kitchen was the topic of much conversation over the Thanksgiving weekend. It is one of those items that you wonder how you ever got along without. What is a Butter Bell and how does it work? It is a crock that keeps soft, spreadable butter on hand at all times. You pour 1/3 cup cold water into the crock, pack a stick of softened butter into the bell shaped lid, then put the lid back on. The bell shaped butter container goes into the water, creating an airtight seal. My crock sits on my counter top. I love it so much! Buttering anything is so much easier now that I don't have to battle cold sticks of butter. You can use it for plain butter, or mix up a gourmet butter for your holiday entertaining. So far I've done both with excellent results. In my mind there is nothing better than spreading a sweet butter on a hot biscuit. Yum! These wonderful crocks would make excellent Christmas gifts. I urge you to check out the Butter Bell website where you will find crocks to fit every decor. They currently have their holiday crocks on sale at a great price. Plus, if you buy any 2 Butter Bell crocks, you will receive a Santa Butter Bell and matching spreader free. That is a really great deal! Any foodie would be thrilled to find one of these nifty crocks under the tree. Want a Butter Bell of your own? 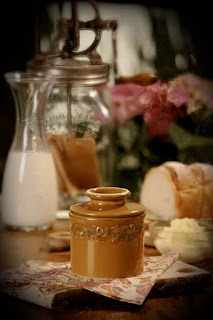 One lucky reader will win the rustic brown antique crock pictured above. To enter simply visit the Butter Bell website, then come back and tell me about which crock you like best or a recipe that caught your eye. This is mandatory for entry. *Become a fan of The original Butterbell Crock here. This is worth 5 entries, so leave 5 comments. I love the Signature Hand Painted Raised Floral Butter Bell® Crock. So pretty! Going back to look at the recipes now. Follow on networked blogs Entry 2. Follow on networked blogs Entry 3. Follow on networked blogs Entry 5. I like Antique Goldenrod Butterbell Crock. I like the Ivory Rose Antique Crock. They are so pretty!! Please enter me:) Thanks!! I love the Sea Spray Antique Butter Bell. Very nice. I like the Sea Spray Antique Butter Bell, too! I like the white w/red trim crock and spreader; and the Santa holiday crock as a cool gift idea! Nessa, I subscribed by email. I don't know why I never did before. Here's my mandatory--I love the golden yellow crock it would be perfect with my dish pattern. I like the Garlic Pepper Butter recipe. Thanks. Butter Bell® Crock & Spreader.